In what has become a veritable cottage industry of predictions for when the 10Y yield will cause a market crash (just last Friday both Tom Lee and Jeff Gundlach chimed in with their latest forecasts), overnight Goldman's economists published a detailed take on i) what has caused rates to jump by 70bps in 5 months, overtaking the Fed's rate hikes over the same period and suggesting that bond vigilantes see the Fed as behind the curve, and ii) how much higher can rates rise before both the economy and the market are severely and adversely impacted. Goldman, which last week followed Gundlach in raising its year-end 10Y yield target from 3.00% to 3.25% (with BofA following just days later), writes that there is no immediate cause for concern as "the recent rise in rates to be well absorbed for two reasons. First, the increase in rates over the last two quarters mostly reflects positive growth news. 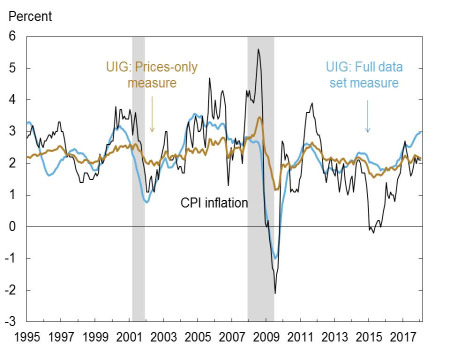 Second, the overall growth impulse from financial conditions remains positive, as equity prices have surged and the dollar has weakened over the last year." And while whereas Goldman's base case expects a "gradual" - that being the key word - rise in the 10-year rate to 3.25% by year-end, the bank stress tests the outlook for a larger increase to 4.5% by year-end. We assume the upward move in rates is driven by an exogenous rise in term premia and simulate the impact on growth using the Fed’s FRB/US model. It is this sharp, aggressive spike in yields that is the worst case scenario as "a rise in the 10-year yield to 4.5% by end-2018 would cause a sharp [economic] slowdown" while "a rise in rates to 4.5% by year-end would cause a 20-25% decline in equity prices." Translated: a potential selloff in rates as a result of the market's "sudden" realization that central banks are set to tighten conditions could unleash a far bigger surge in 10Y yields than what was observed so far, leading to dramatic consequences for stocks and to a lesser extent, the economy, and while a recession would be avoided despite a "short housing recession", a market crash would be unavoidable. ... the highest in over a decade, and rising fast, well above the core CPI reading noted recently by the BLS. On one hand, a rise in the 10-year yield to 4.5% by end-2018 "would cause a sharp slowdown but no recession, with hits to GDP growth of 0.5pp in 2018 and 1pp in 2019, lowering GDP growth to 2.25% and 1% respectively." On the other hand, such a sharp spike in yields would crush stocks, wiping out a quarter of the S&P's market cap, or as Goldman puts it: "the model implies a peak 200bp tightening in our Financial Conditions Index (FCI), mostly driven by a 20-25% decline in stock prices." And that's just the start as "a larger exaggerated response of financial markets to the rates shock may trigger a sharper slowdown." Before we get to the detailed analysis why risk assets will have an increasing sensitivity to higher yields from this point on, first here is Goldman's explanation why rates have risen as high, and as fast, as they have. We highlight two reasons for resilience to the recent bond market sell-off. First, part of the increase in interest rates is likely driven by positive growth news. We estimate the underlying macroeconomic drivers by analyzing the changes in correlations across asset classes. Exhibit 2 shows that investors’ optimistic growth views account for an estimated 60bp of the 75bp increase in the 10-year rate since September. The intuition is that nominal interest rates, breakeven inflation, and stock prices have mostly risen together over this period. It is only in February that expectations of more hawkish policy and higher inflation have also significantly driven the rates sell-off. While activity tends to decelerate if the increase in rates is driven by more hawkish monetary policy, higher inflation, or wider risk premia, it tends to accelerate if the increase in rates is driven by positive growth news. Next, Goldman points out the paradox observed over the past year (which prompted Goldman itself to question if the Fed - which is desperately seeking to tighten financial conditions - has lost control of the market), in which higher rates have resulted in even higher stocks, and financial conditions which until the Feb vol swoon were the loosest on record. Second, we estimate that the negative growth impulse from higher rates is more than offset by the boost from surging equity prices, narrowing credit spreads, and dollar cheapening over the last year. While our FCI is modestly tighter than in early 2018, it remains significantly easier than in early 2017. 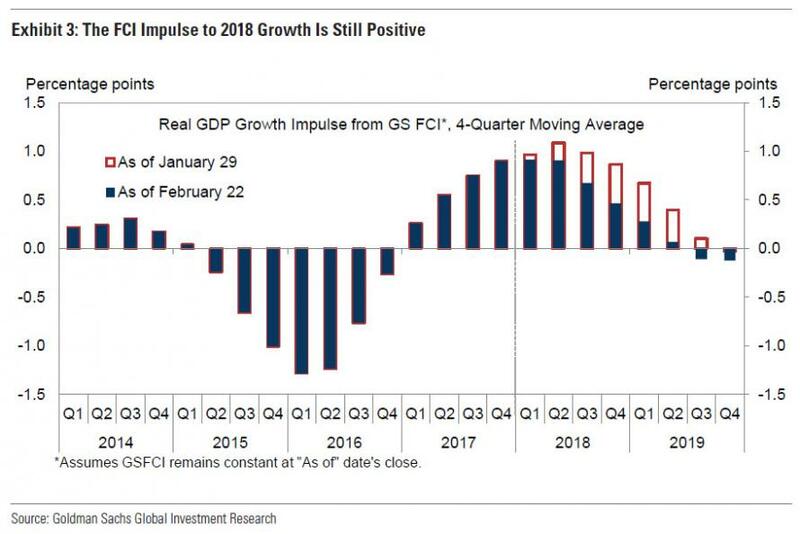 This means a somewhat diminished but still clearly positive FCI impulse to growth this year, barring a more substantial and broad-based tightening in financial conditions in the coming months (Exhibit 3). Whether Goldman is right or not about its optimistic take on rising rates, of course, will be determined only after the fact. The big question now, however, is what happens next should the rate increase accelerate. 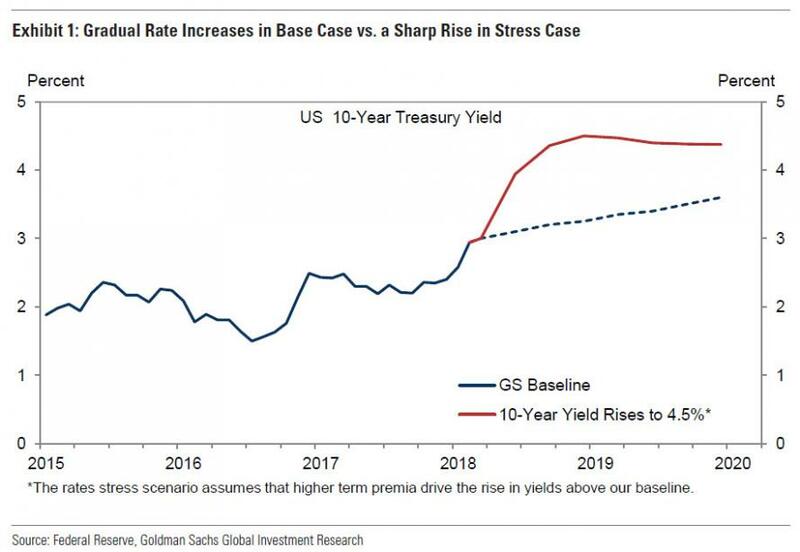 To do this, and "to get a feel for the impact of further sharp rate increases", Goldman conducts a “rates stress” scenario, where the 10-year rate rises to 4.5% by year-end. According to Goldman economist Dean Struyven, "the 160bp increase in long-run rates over the next 10 months would correspond to a roughly 2 standard deviations move." We also assume that the 125bp overshoot above our forecast is driven by an exogenous increase in bond term premia. We simulate the impact on growth using the Fed’s FRB/US macroeconomic model. In the stress scenario, year-on-year GDP growth slows to 2.25% in 2018 and 1% in 2019, well below our forecast of 2.8% and 1.9% respectively. The model implies peak drags on GDP and consumption growth of 1pp and 0.5pp respectively, while the peak hit to business investment growth is 2.25pp. Higher interest rates weigh the most on residential fixed investment with a peak hit to growth of 6pp, pushing the sector in 2019 into a short “housing recession”. Exhibit 4 shows the growth rates of GDP, consumption, business investment, and residential fixed investment in the baseline and stress scenarios. Interest rates affect the economy through many channels, but their impact on broader financial conditions is a key input. The FRB/US model implies a peak 200bp tightening in our FCI in the rates stress scenario, as shown in Exhibit 5. A 20-25% decline in stock market wealth contributes 110bp to the move. The contributions from a 125bp increase in longer-run rates (55bp), a 5% dollar appreciation (30bp), and a 5bp widening in corporate spreads (5bp) are smaller. We think that volatile risk asset prices may initially respond more to the rates shock than implied by the fundamentals-based FRB/US model. This factor alone would suggest that the peak hit to GDP growth could be larger than 1pp. In other words, 25% is just a low-ball estimate based on the Fed's "rational" model: the full impact, when accounting for jittery vol-targeting funds, risk parities, retail investors shorting volatility and so on, could result in a far bigger hit to the S&P! 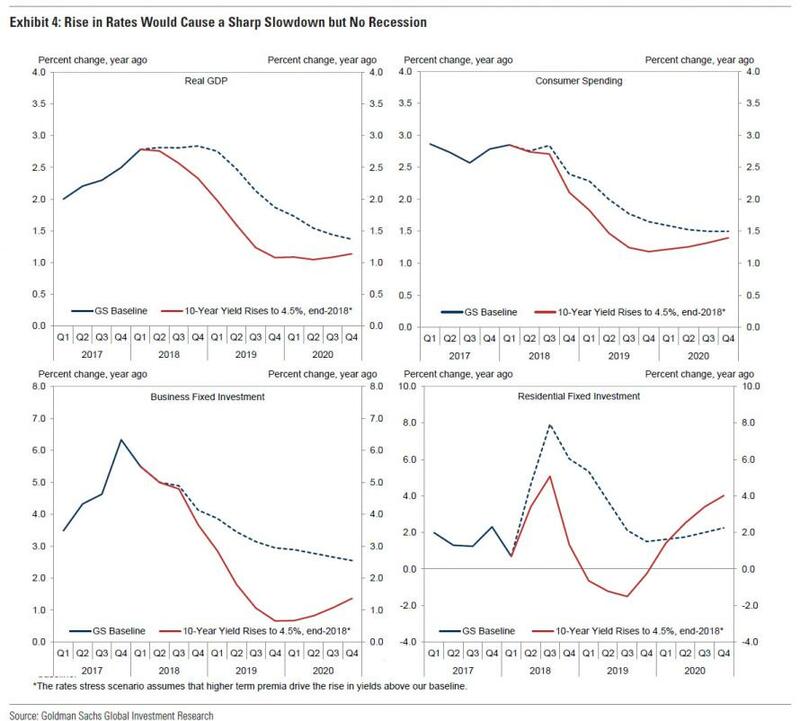 Goldman concludes cheerfully, noting that "the analysis moderately increases our confidence that today’s economy —which is benefiting from strong momentum, firm global growth, and a fiscal boost—should be able to weather fairly large rate increases, without spiraling into a recession. While the aggregate impact of a continued bond sell-off should be manageable, we conclude by noting that several important sectors—including housing and smaller business activity— would likely experience sharper slowdowns." It also concludes that if the 10Y selloff accelerates by another ~150bps, the market will crash, although the bank remains confident that conditions for such a sharp selloff are not (yet) in place. 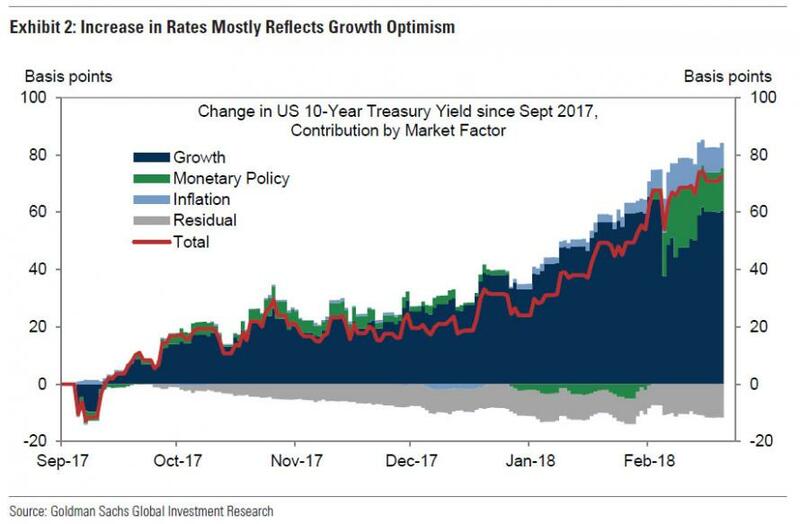 It is worth pointing out that Goldman's dire forecast, while realistic, is another example of "moving the goalposts": one year ago, when rates were in the low-2%'s, consensus was that a move to 3% or higher would lead to a market crash. Now that we are there, banks are scrambling to push the threshold even higher, despite the recent 10% correction once the 10Y broke what until recently was Gundlach's red-line in the upper 2%-range. Finally, while a sharp market selloff is certainly inevitable the higher rates go (especially if 10Y yields are rising due to real rates and not breakevens), the fate of both rates - and stocks - is ultimately be in the hands of the Fed, and Jay Powell in particular. Any further hints from the Fed (in addition to the ones we noted last night) that the central bank believes it is behind the inflationary curve, any hints of 4 or more hikes in 2018 and further hikes in 2019, and the selling of risk assets will surely start far sooner than Goldman expects. And for the biggest, and most immediate hint, keep a close eye on Jay Powell's testimony on Tuesday, when a big part of the "what is the Fed thinking now" puzzle will finally be revealed.